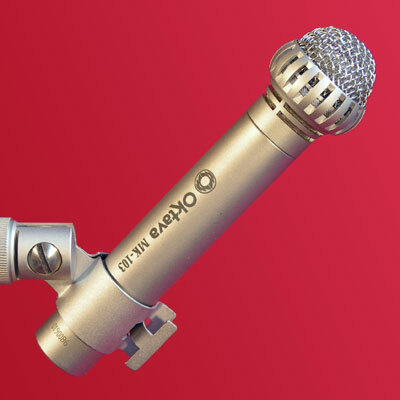 Released in October 2006, the MK-103 is a mid-sized diaphragm mic developed to compliment Oktava small and large diaphragm condenser mics. It provides a useful gradation in time domain response between the small and large diagram sizes and offers excellent cardioid pattern attenuation over a broad frequency range. On Axis – Quick transient response and extended high frequency response are hallmarks of the MK-103. Off Axis –Moderately strong attenuation at 90 degrees creates a tightly focused cardioid pattern while very strong midrange attenuation at 180 degrees minimizes room sound and unwanted sound source pick up. The MK-103 excels where the recordist wants fast transient response, extended high end and strong attenuation of ambient room sound.